Disneyland Resort celebrates a dozen new awards from the Southern California Restaurant Writers, with tributes for 2013-2014 going to restaurants at Disneyland Park, Disney California Adventure Park and the Disneyland Resort hotels. Each year, the Southern California Restaurant Writers evaluates restaurants from Santa Barbara to the Mexican border on food, service, ambiance and beverages. 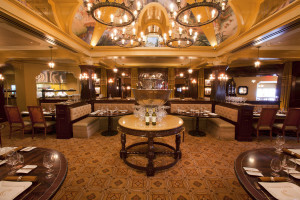 Three Disneyland Resort restaurants received highest honors, earning the coveted Five Star award and the Golden Bacchus Wine Award: Carthay Circle Restaurant and Lounge in Disney California Adventure Park, Napa Rose in Disney’s Grand Californian Hotel & Spa, and Steakhouse 55 in the Disneyland Hotel. These, plus several other prestigious awards, were presented to the Disneyland Resort staff at the 2013-2014 Southern California Restaurant Writers Annual Awards Banquet held on April 13 at the Astor Classic Events Center in Anaheim, Calif. The highlight of the evening was the recognition of Jose Barragan, named “Manager of the Year” for his work at Carthay Circle Restaurant and Lounge. Barragan has been with Walt Disney Parks and Resorts for 17 years. 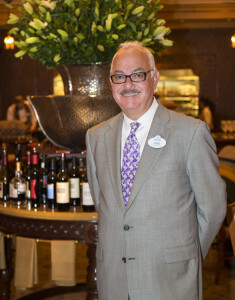 He brings 35 years of food service experience, plus a business administration education, to Carthay Circle Restaurant and Lounge. Prior to his Disney career, he spent 11 years at the Four Seasons Hotels and Resorts and four years at the Ritz-Carlton. “Jose’s years of managing fine dining, as well as his passion and expertise for creating amazing dining experiences, have enabled us to create a signature restaurant that no one would expect to find inside a theme park,” said Michele Gendreau, general manager of Food & Beverage at Disney California Adventure Park. Carthay Circle Restaurant and Lounge harkens back to the Golden Age of Hollywood at the heart of Disney California Adventure Park. The seasonal menu, created by award-winning Executive Chef Andrew Sutton, celebrates California’s diverse cuisine. Guests enjoy varieties of sustainable fish, both wild and farmed, in dishes such as ceviche of blue cobia and sesame-soy-glazed Skuna Bay salmon. The lunch menu includes seasonal salads, such as Strawberry Chicken, an Angus burger with cheddar cheese and house-made pickles. A friendly wine program includes both Old and New World wines, with a focus on California vintages. 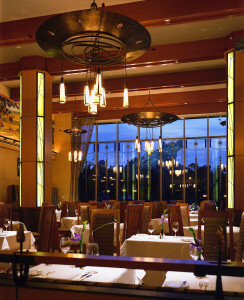 Napa Rose, at Disney’s Grand Californian Hotel & Spa, also earned Five Stars and the Golden Bacchus Wine Award this year. Napa Rose showcases California wine country cuisine, changing its menu seasonally to source the finest, freshest ingredients. The cuisine is created to complement the restaurant’s extensive California-dominated wine collection. The 17,000-bottle cellar carries more than 1,000 different labels, with 80 wines available by the glass. With 12 awards going to eight restaurants – two in Disneyland Park, two in Disney California Adventure Park and three in Disneyland Resort hotels – Disneyland Resort guests have outstanding dining options and locations to choose from on their visits. 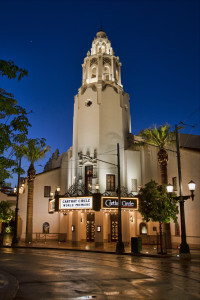 This entry was posted in Home Page, Home Page Slider, News and tagged Ariel's Grotto, Astor Classic Events Center, Blue Bayou Restaurant, Cafe Orleans, Carthay Circle Restaurant and Lounge, Dan Coleman, Disney's Grand Californian Hotel & Spa, Disneyland Hotel, Disneyland Park, Disneyland Resort, Executive Chef Andrew Sutton, Five Star award, Four Seasons Hotels and Resorts, Golden Bacchus Wine Award, Goofy’s Kitchen, Jose Barragan, Michele Gendreau, Napa Rose, Philippe Tosques, restaurants, Ritz-Carlton, SCRW, Southern California Restaurant Writers, Southern California Restaurant Writers Annual Awards Banquet, Steakhouse 55, Storytellers Cafe, The Walt Disney Company, Theme Park Adventure, TPA, Walt Disney Parks and Resorts. Bookmark the permalink.